heir. As the people rally around him, Rustav teeters precariously between raising his people from the dust—or destroying them from the inside. An interesting adventure that I believe middle grade to young adult readers would enjoy. Escaping his abusive Uncle's clutches, Rustav heads to the forest full of Demon's yet get's sidetracked by his injuries and new friends. The adventure continues as Rustav and his new friend Dantzel flee to the forest. But the forest hides a powerful secret, a secret that could cost Rustav and Dantzel their present, as well as, their pasts and their futures. Can they escape the forest before it is too late and Courei falls to the demons and those who would see the nation fall? And will Rustav discover the truth of who he truly is? 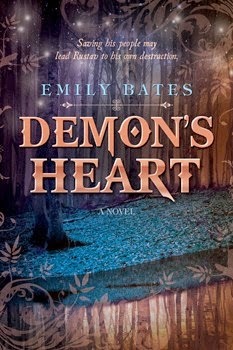 Demon's Heart is an engaging book, but one that I had a hard time getting into at first. It took a few chapters for me to grasp the content enough to keep reading. It is definitely the type of book that needs read over a few times to find all the information and clues that were missed the first time through. Not my personal favorite but one that adventure, fantasy/sci-fi and mystery lovers might truly enjoy. I would recommend this for ages 14 and up due to abusive situations. I received free the item(s) mentioned in this post in exchange for my honest review through Cedar Fort. Regardless ~ All my reviews are my honest and personal opinion. I am disclosing this in accordance with the Federal Trade Commission’s 16 CFR, Part 255: “Guides Concerning the Use of Endorsements and Testimonials in Advertising.”.